Foodservice operators face a tall order when it comes to managing coffee service efficiently and profitably, not to mention meeting the standards of high quality and variety that consumers demand these days. According to Technomic’s 2018 Beverage report, consumers purchase an average of 3.8 beverages per week away from home; in terms of coffee, 37% of consumers say they are ordering it more now than they were two years ago. That means there’s a lot of opportunity for foodservice establishments to attract consumers’ coffee dollars. In the healthcare setting, customers may be at work or they may be a patient, but that doesn’t mean they should have to settle for lackluster coffee options. In fact, to compete with chain cafes, healthcare foodservice operators should strive to offer the latest trends in format and flavor. This way, customers won’t have to stop at a local cafe on their way in and can instead save their coffee trip for once they arrive. But offering the latest trends can be a challenge. 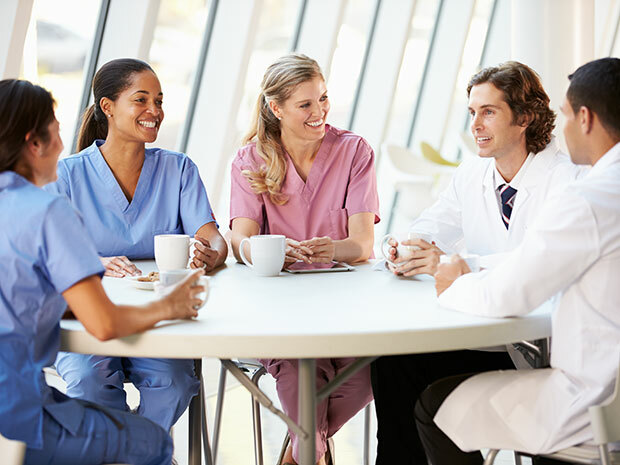 Hospitals encompass patient service as well as cafeterias, waiting rooms, nurses’ stations, staff break rooms and specialty coffee kiosks, and each station may offer different products or cater to different consumers’ preferences. For instance, coffee in break or waiting rooms may only need to offer drip coffee with a few creamer options, while specialty coffee kiosks would need to offer more complex and trendy options, including seasonal flavors or specialty beverages. Operators must satisfy the tastes of a wide array of consumers, from doctors, nurses and other healthcare workers, to patients, their families and other visitors. Plus, healthcare campuses are open 24 hours a day, seven days a week. With all these different variables and needs, how can operators cover all the bases without breaking the bank or needing to keep complicated inventory logs? New coffee formats are hitting the market all the time, which can complicate things for operators. Between options such as nitro cold brew or complicated made-to-order beverages, how can healthcare coffee programs compete? Easy—operators must set up the right blend of brewing equipment types and coffee varieties to fit the demands of each location. Offering an array of different brews and options is crucial to ensure that everyone finds what they want, when and where they need it. For patient-tray service or for coffee service during busy meal periods in the cafeteria, a high-volume unit, such as one from the Select Brew™ Coffee System from Smucker Away From Home, is ideal. These on-demand coffee machines offer simple yet reliable consistency, cup after cup. Additionally, they dispense drinks quickly, which is ideal for keeping the line moving, and they don’t need to be continually checked or brewed manually to keep up with demand, which saves time for kitchen and foodservice staff. Select Brew™ machines dispense freshly made coffee on demand 24 hours per day, with no leftovers to worry about. Plus, they are quick and easy to sanitize, featuring a clean-in-place format that requires only five minutes a day to clean. Equipment from the Smucker Away From Home Select Brew™ Coffee System dispense traditional and specialty coffees, with equipment options that can dispense drinks such as espresso, lattes and cappuccinos, along with decaf coffee and hot water for tea. Some units also allow for ambient-temperature coffee dispensing—perfect for iced coffee lovers. Operators can also offer flavored syrups alongside these options for additional customization and indulgence. Catering to a variety of consumer preferences is key to success. With single-touch systems paired with convenient choices of flavors and creamers, it’s easier than ever to give consumers what they want.